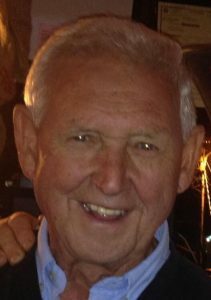 Clarence James (Jim) Turner, 85, of Washington Court House, Ohio died Tuesday, September 4, 2018, at 1:25 a.m. at the Riverside Methodist Hospital in Columbus where he had been a patient since August 29. Jim was born November 17, 1932, in Ashland, Ohio to Arthur Dewitt and Helen Marie Ryland Turner. Before his retirement, he was owner and operator of Southern Field Services. He was a 60-year member of Pilgrim Lodge F & AM #691 in Steubenville; 32nd Degree Masons, Valley of Steubenville; Aladdin Temple Shrine in Columbus and Bellevue Aerie #490 of the Fraternal Order of Eagles. He served in the U. S. Navy and was a member of North Strand American Legion Post 186 in Little River, SC. He enjoyed the water, boating and working with cattle. Jim was preceded in death by his parents; a son, Christopher Turner; a brother, Sam Turner and a sister, Judith Dempsey. He is survived by his wife, the former Martha Ann Miller; five children, Theodore Turner and his wife, Chauna, of Brooklyn, NY, Melissa Turner of Columbus, OH, Matthew Schenk-Turner and his wife, Jennifer, of Charlotte, NC, Sarah Dutton and her husband, Chris, of Washington Court House and Thomas Turner and his wife, Shannon, of Bellevue, OH; several grandchildren; a brother, Arthur “Artie” Turner of Columbus, OH and a multitude of friends. The funeral will be Saturday, September 8, 2018, at 3 p.m. at the Kirkpatrick Funeral Home in Washington Court House with Dr. Freddie W. Dutton, minister at the Southwest Freewill Baptist Church in Columbus, officiating. Cremation will follow the service. Friends may call at the funeral home Saturday from 1 p.m. until time of the service. Memorial contributions may be made to Shriners’ Crippled Children’s Hospital and Burns Institute, c/o the Washington Shrine Club, P.O. Box 164, Washington Court House, Ohio 43160.
music. I will always remember this great freind.